Discussion in 'Minnesota Vikings' started by La France Blanche, Sep 5, 2018. Wide receiver Chad Beebe is on the practice squad, along with LB Garret Dooley and O-linemen Colby Gossett and Storm Norton. The Vikings will be Caste Football's favorite team this year (sorry, Patriots, but get some palefaces on defense, please). With QB Kirk Cousins leading the way and three White men - Thielen, Sendejo, and Smith - starting at Caste-verboten positions, this will be a team to cheer for consistently week after week. I was browsing the SI NFL preview edition the other day and was curious what they’d say about Minnesota. Compliments towards Thielen, but even better, they call Smith and Sendejo the best safety tandem in the NFL! Mega-bust Laquon Treadwell, whose latest drops were so bad that even some DWFs are calling him out, remains on the active roster and may or may not be replaced at the #3 receiver position by another upsider, Aldrick Robinson. In a truly anti-racist league, Treadwell would be finished, and there would be no need to bring in Robinson when it would make much more sense to have Brandon Zylstra or Chad Beebe take the #3 receiver spot behind Thielen and Diggs. Heavens no! Thielen is firmly entrenched as the token white WR, the "honorary black". That's how he is seen by the predominantly black locker room. Bringing in more crackers to take "theys pozishuns" will upset the finely balanced racial equilibrium and cause the blacks to grumble and there goes the season! Minnesoota might want to rethink their placekicker as well, missing as much as he did in yesterdays game especially the potential game winning field goal is not so good....strong leg maybe not so strong mentally yet.. They cut Carlson today. That last chip shot that he missed in OT did him in. Very sad. But hey, all of the replacement kickers are white, with a few latinos and asians maybe available. Not a glamorous enough position for the magical ones to pursue, apparently. High pressure position no one cares about until they miss! I remember wanting to yank my hair out at times when Mason Crosby had his struggles with misses a few years back. Cost GB a couple of close games and I like many others wanted him axed. Looking back at it glad we didn't, he was a veteran though and given opportunity to right the ship. Big fan of the Sendejo/Smith combo at Safety. Truly believe best safety combination in the league. Been saying it for awhile to a Vikings DWF I know. Zylstra survives! Black receiver Stacy Coley cut instead to make room for black replacement Aldrick Robinson. Now Aldrick Robinson can start dropping passes and running wrong routes. 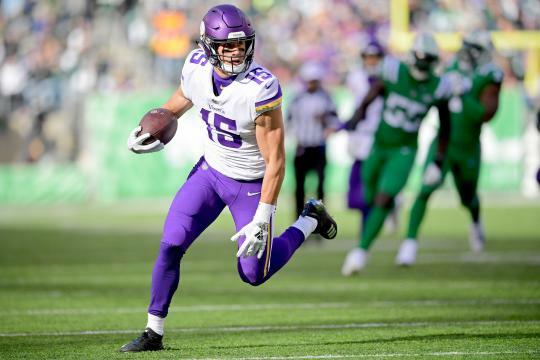 With WR, Chad Beebe, activated from the PS for last week’s game, the Vikings now have 21 whites on their 53-man roster, including 3 white WR’s (Thielen, Zylstra, and Beebe), 3 white TE’s (Rudolph, Morgan, and Conklin), 3 white QB’s (Cousins, Siemian, and Sloter), and 2 white safeties (Smith and Sendejo). I’m rooting hard for this team to hoist the Lombardi Trophy February! all the way. I like the Rams roster too, as it is made up of all the overachievers we appreciate. If it comes down to them both in the NFC Championship it's a win-win but I'd pull for the Purple People Eaters. And yes, I'd probably pull for either one against our beloved Pats on the AFC side even though it would feel very odd. The Pats I love, but their 53 ain't what it used to be. The GM and draft decisions have disappointed me in recent years. A Vikes vs Pats SB would be great for the world to see and a kick against the Caste System. I am pleased with the way QB Kirk Cousins and WR Adam Thielen connected this season. Adam had his best year with a 113-1373-9 stat line setting career highs in all categories. Granted during the latter part of the season things didn't run as smoothly and Adam's stats were dramatically down. As for the sideline "friction" between the two of them I don't too much stock into it and the players addressed it in post game interviews. The Vikings, one of the favorites if not the favorite here at CF let us down by not even getting into the playoffs. In my mind Cousins and Thielen are the backbone of this team so the key is to build around them. Improving the OL in pass and run blocking though is imperative. And the defense needs impact edge LBs and better CBs along with a DT that can penetrate the middle of the line. And they should have released DE Griffen who was showing psychotic tendencies. Poor team decision on that score. The string on HC Zimmer will loosen pretty quickly if they backslide even further next season so there will be a lot of pressure on them to right the ship. And pressure on Cousins to win big games which he hasn't done for the most part of his career. But Cousins is a fine looking QB you can win with in this league. The key is improving the obvious potholes. Like the Steelers the Vikings seem to be at a crossroad where they could either slip further down or rise back up again.